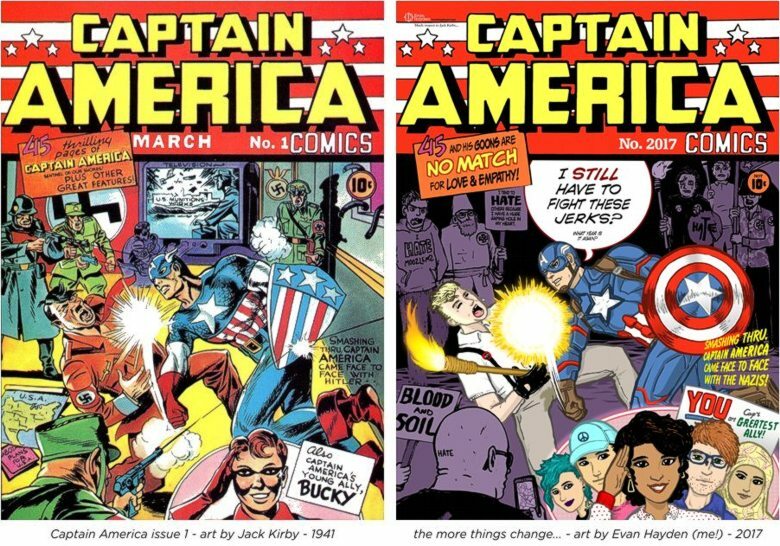 Feeling deeply troubled by the news of the racism and violence in Charlottesville, I decided to make something cathartic, and a tribute to Jack Kirby’s great 1941 Captain America issue 1 cover. It seems like history is repeating, no matter what name this hatred labels itself. Alt-right? Nahhhh, Nazis by any other name. I’ve never been a blind patriot, but I’ve always appreciated the multicultural side of America, and the fact that our major metropolitan areas are like microcosms of the world. I think the mix of cultures makes us all stronger, and I deeply sad to see that some people would want to hurt that diversity. If Captain America were real, I don’t think he’d approve. Anyway, this was a fun little thing to make. Click the pic above, or here, to check out a much larger view of this piece, as well as bonus stuff!